IntakeQ allows you to schedule forms to be sent based around appointment dates. For example, you can schedule a feedback form to be sent one day after appointments. This is done by using our "Automated Emails" feature. Note that in most cases, the best way to send intake forms for appointments is to set it up in the Service settings. This will ensure that the form is sent as soon as the client books an appointment and will give them more time to submit it. If you are creating the appointment in the Calendar, you can also send the form from there. Let's look at an example of how you would schedule a form to be sent 1 day after appointments. Navigate to "Bookings > Booking Settings > Emails". 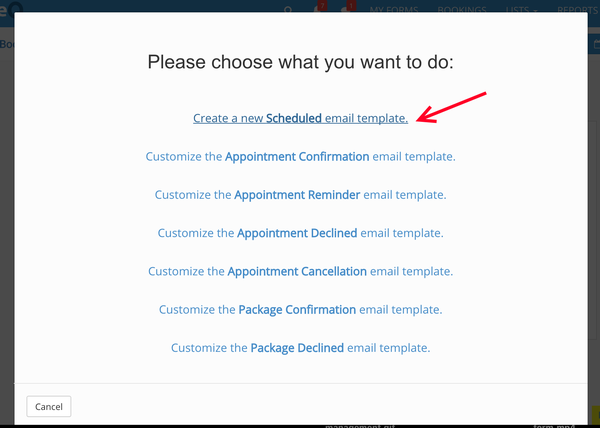 Select the option "Create a new Scheduled email template". Next, you can specify if this form will be sent for all services, locations and practitioners, etc. 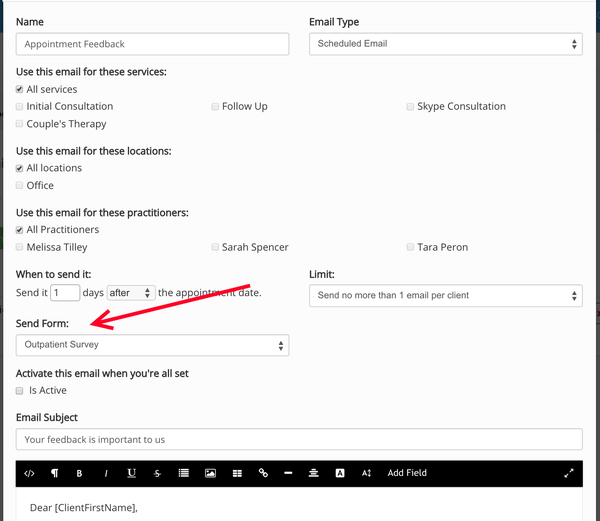 In the "When to send it" field, indicate that you want the form to be sent 1 day after the appointment. Note that you can also limit the number of times this email is sent to the same client. Select the form to be sent under the "Send Form" field. Enter the Email Subject and compose the email body. In order for the client to fill out the form, you need to insert the form URL in your email body. To do that, place the cursor where you want to include the form URL, then click on the "Add Field" button and select "Form URL". This will include the placeholder [FormURL] in your email template. The placeholder will be replaced by a form button and password once an email is sent. Finally, when everything looks ready, make sure to check the "Is Active" box and click on "Save".